Discussion in 'Designers and Collections' started by khyrk, Jun 24, 2009. If your claim to fame is chic and luxe accessories, why not use quiet elegant fashions to set them off? Brian Atwood did just that as he dressed his models in double- and single-breasted jackets and suede sports jackets and furnished them with ultracool accessories — deerskin high-tops, hand-burnished loafers and tan luggage trunks and golf accessories sporting Bally’s signature stripes and crest. i cannot wait to see more. brian atwood has done wonderful things with that heritage since he's come to that house. i like the shoes and the bag in the first pic... i im gonna like this... cant wait to see more! I died a little over the second look. I've never though much of Bally, but this is nice. 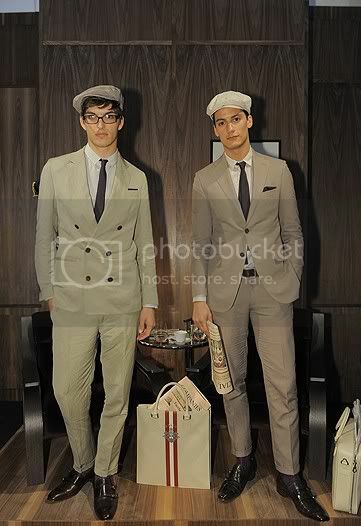 the monk straps in second pic, and that white tote in third pic = yummy! Not bad, provide some more pics! ?